Dr. Mary Crowell lives with her husband, Wesley, and their son, Simon, in Athens, Alabama. She has taught piano and composition for twenty plus years. She has taught music theory, piano, and music appreciation at Calhoun Community College in Decatur, Alabama, but currently maintains a private studio where she teaches piano and composition. Mary also composes, transcribes, and arranges music and enjoys accompanying. She loves playing Rachmaninov, Chopin, Gershwin, Bach and jazz standards; practicing yoga, gardening; and gaming with good friends. Mary Crowell has a B.A. in piano performance from Huntingdon College, M.M. in musicology from the University of Alabama in Tuscaloosa, and a D.M.A. in music composition -- also from the University of Alabama. While acquiring these degrees she accompanied ballet classes (and still twitches when she hears "Let's go. Five, six, se-ven, eight! "), helped organize receptions and run concerts as a house manager, graded many music appreciation and history papers, and taught freshmen music theory, ear training, and sight singing. She also snuck around and performed jazz whenever her teachers weren't looking. Mary was introduced to filk music by Karen Murphy and John Brewer who paid her way and drove her to her first filk convention -- GaFilk 2001. And now people cannot keep her away with sticks. She's written several torchy songs (Magnus Retail, and Oh Milo); blues songs (Legolas and City of Doors); and some that defy description (The Song Will Tell Me True). She enjoys making lead sheets for the GaFilk Songbook using the latest incarnation of Finale. Mary may be seen at general science fiction conventions as well as more specialized filk conventions performing and accompanying concerts on piano and occasionally clarinet. In February 2012 she was international guest of honor at Duple Time, a filk convention in Grantham, England. The very next month she performed with Gwen Knighton, Teresa Powell, and Brenda Sutton as Three Weird Sisters. As the musical director of the swinging jazz band Play It With Moxie, she performs in the greater Atlanta area at GAFilk, Anachrocon, and S.T.E.A.M. Fest. Play It With Moxie Live! was released in 2012 by Play It With Moxie. It can be found through CDBaby, or Bandcamp. She is part of the latest reimagining of Three Weird Sisters, and some of her songs are on their latest CD, Third Thyme’s the Charm (2012 Bedlam House) available at Amazon, CDBaby, and Bandcamp. 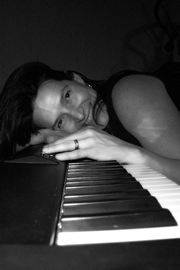 Mary Crowell’s most recent awards include a Pegasus award for Best writer/Composer (2012) and Best Gaming Song (2012) for her song “I Put My Low Stat. ” “I Put My Low Stat” also won best gaming song in E.N.World’s Battle of the Bards. In 2007 Mary tied with Seanan McGuire for a Pegasus award in the category Best Performer. Other songs of Mary’s have been considered for Pegasi as well. "When I Grow Up" was nominated for a Pegasus Award in the category Best Comic Book Song in 2004. "Legolas" was nominated in the category Best Torch Song in 2006. And “Magnus Retail” was nominated in 2010 for Best Magic Song. Poison Ivy, her octet for flute, clarinet, oboe, bassoon, french horn, trumpet, and trombone was performed at the UAH Local Composers Concert in March of 2004. Mary gigs in Athens, Alabama at downtown bookstores and garden markets as well as performing at festivals and conventions with various bands in the greater Atlanta area. Her convention schedule tends to keep her fairly busy. In 2007 Mary released her first album Courting My Muse, recorded with Greg Robert. Courting My Muse is available through various filk dealers, Amazon.com, and CDBaby.com. It is also available at Pablos on Market, a delightful bookstore and coffee shop on the square in Athens, Alabama. Mary Crowell's second solo album, Acolytes of the Machine & Other Gaming Stories (2012), is an unabashed love letter to the hobby of playing Dungeons & Dragons created by a singer/songwriter and folk/jazz piano composer who plays a Bard in Real Life.